It gives great happiness when give a functional life to things or objects again which get retired after a specific duty or purposes! Recycling is something that whole world needs to do on a bigger scale to give some extra life to natural resources like wood! So while talking about the wood recycling, the “pallet” is the first name that come to our mind! 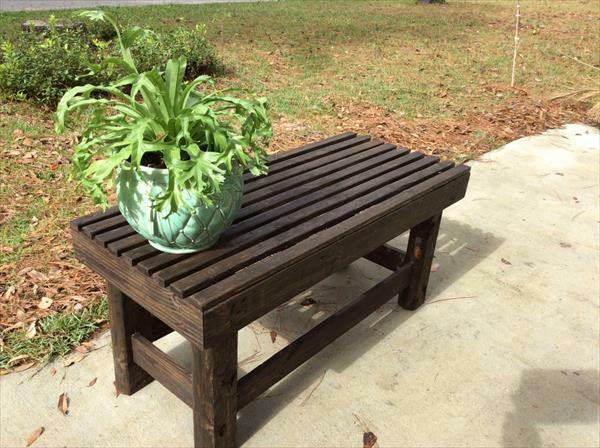 Pallet wood furniture creative recycling trends are all the rage now and this DIY versatile pallet outdoor bench is the latest recommendation to reuse pallets! Building this outdoor bench out of pallets will be cost-efficient and versatile behavior of this bench can really rock your outdoor! Grab this bench to sit around the firepits or at front porch or patio area or just install it as an accent table to your green space to create a visually pleasing display of garden pots! 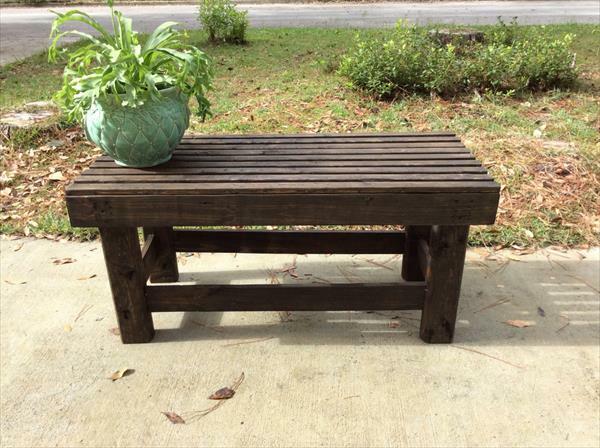 Pallet wood slats are all that build this sturdy design of bench and darker hue has been got using respective shade of stain!